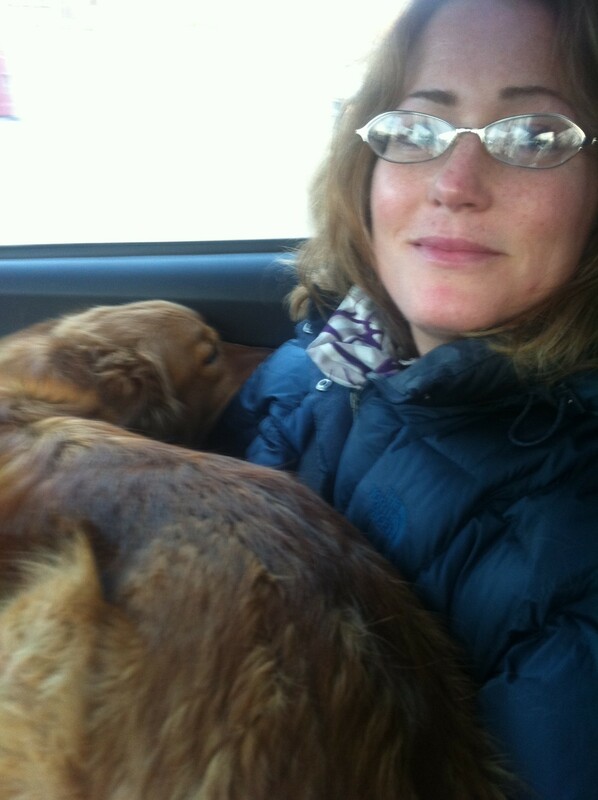 Winnie, Guffman, and I drove from Chicago to Madison this morning to be part of the WORT-FM interview at 1:40. It started snowing on our way up (April, sigh), but we made it in time to check in to our hotel and walk to the Four Star Video Heaven for the interview. They let Guffman in as long as he didn’t bark, which he did almost immediately. So, Winnie and Guffman were banished to the “green room.” We were able to listen to the archive of the show back at the hotel. I’m on from minute 40-48. Here it is. The guys on the radio were really funny and nice and it was fun to be on with them. After the interview, we dropped off Guff and went out to lunch with two other filmmakers who were interviewed, Justin (here’s his film) and Brett (and his film). It turns out that Brett played his film at the Cucalorus Film Festival AND the ReRun Theater. AND he came to see BREAKING AND ENTERING at Cucalorus. I’m going to break my run of not going to see other films at film festivals and Winnie and I are going to see his at the Student Union Theater tomorrow. (Justin’s is already sold out). After lunch we picked up the passes from theater and walked back to our hotel. My friend Andrew Kaplan has some ins in Madison and was able to get posters put up around town and we stumbled on one near the Union. It looks really cool around the other posters! Thanks, Andy! It also turns out that Winnie sells her jewelry (she’s a jewelry designer and a pretty darn good one if I do say so myself) to a store only a few blocks away from our hotel, Atticus. We checked it out and now we’re back at the hotel. We play tomorrow at 11:00 a.m. at the Student Union Theater. A dozen or so years ago I saw the short movie COVEN at the Wisconsin Film Festival, which was featured in the documentary AMERICAN MOVIE. AMERICAN MOVIE is still my favorite documentary (BREAKING AND ENTERING is a close second), and is a big reason I wanted to make a documentary. So I feel a little nostalgia here in Madison, and I’m looking forward to tomorrow’s screening. Great reviews and articles out of Madison! With the Wisconsin Film Festival around the corner we’ve been getting a lot of publicity. The Isthmus calls Breaking and Entering one of the 12 “sure things” at this year’s festival. Here’s the entry from the film guide. We’re screening Saturday, April 2, at 11:00 a.m. at the Student Union Theater. I’ll be driving down with my wife and dog. Please spread the word to anyone who might want to see the film in Atlanta. It’s good. I promise. Screening in Asheville, North Carolina – Tuesday at 7:00 p.m. Happy to be in warm North Carolina! 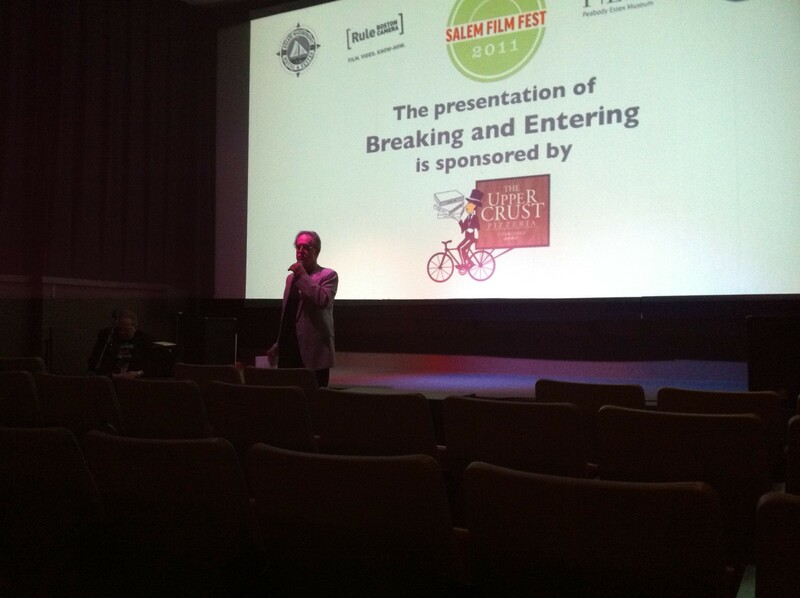 Breaking and Entering will be screening in Asheville, NC tomorrow night at the Regal Biltmore Grande Stadium 15. It’s part of the Asheville Cinema Society. I’ll be there for a Q and A after the screening. 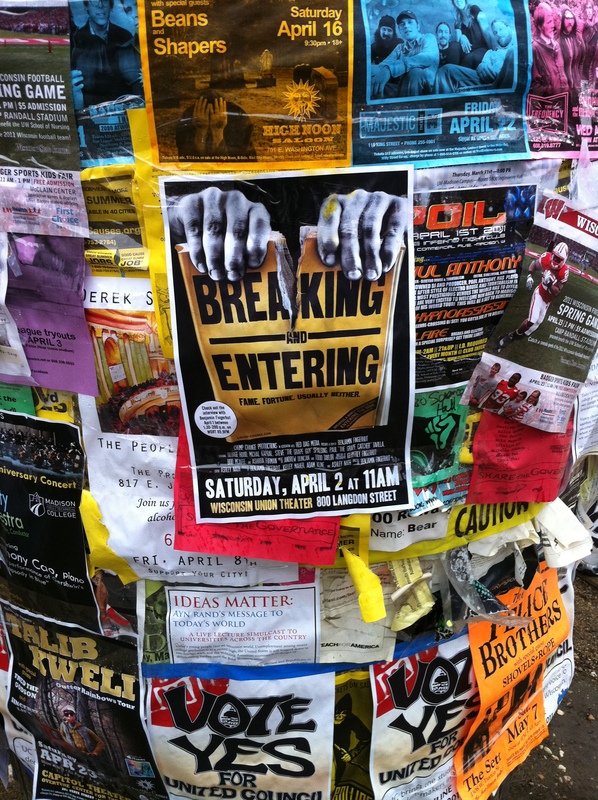 On Tuesday, March 22nd, we’ll be screening Breaking and Entering as part of the Asheville Cinema Society. My wife and I went on our honeymoon near Asheville a year and a half ago, so I’m excited to go back. Thank you, Salem Film Fest! My wife, dog, and I hopped in the car on Friday morning at 7:00 and drove 17 hours to Salem, MA to be part of the Salem Film Fest. It’s a really cool documentary-only and invite-only documentary film festival that is in its 4th year. We arrived early morning and stayed at the Salem Inn, which was built in 1835. I got up a few hours later for a first time documentary filmmakers panel with three other filmmakers from two films: A Good Day to Die, and The Sons of Perdition. It was a fun panel, and despite their films’ subject-matters being quite different than Breaking and Entering, I felt a kinship with them. They clearly have a lot of passion and it was nice to see. The screening went really well, and we had a good Q and A afterwards. We met a great woman there named Rhonda Moskowitz who is working on her own documentary, and actually started a documentary filmmaking club in Boston where they talk about their docs, show rough cuts, etc… called Connect the Docs. 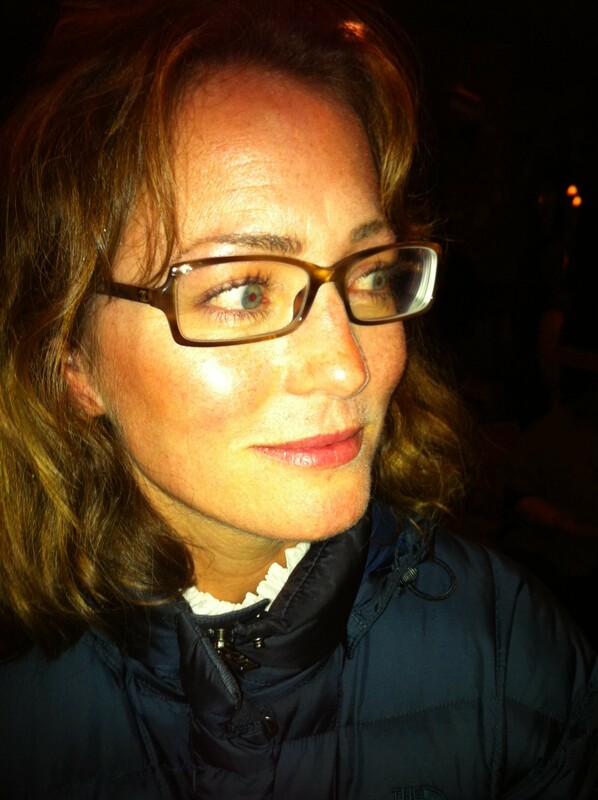 Couldn’t meet a nicer woman, and I can’t wait to see her film in early 2012. My wife, Winnie, and I ended up hanging out a bit later with Jennilyn Merten (The Sons of Perdition), and swapped war stories. I haven’t seen her film yet, but listening to what she went through shooting her documentary had me on the edge of my seat, so I’ll definitely check it out when it comes to Chicago. I think she said that it will be on Oprah’s OWN channel in August. Winnie tried on her glasses later and is trying to find her own pair on ebay. Before I go to these film festivals I always promise myself that I’ll take a lot of pictures and that I’ll have the audience sign up for the mailing list, and I always forget to do both. But I have a few pictures here. As always, I regret not going to more screenings, but it was tough with our dog, Guffman, being there. Now Winnie, Guffman, and I are unwinding and catching up on emails at her family friend’s house in Cape Cod. It’s off-season, but going on long walks during the day and eating good food at night is good for the soul. Thanks to Salem and the film festival! Also, Buffalo-Niagra and Tallahassee Film Festivals! Also excited to be part of the Buffalo-Niagra Film Festival and Tallahassee Film Festival. We screen on April 12th at 4:00 p.m. at the Market Arcade Film & Arts Center in Buffalo. Don’t know the screening date or time of Tallahassee yet, but it’s sometime between April 6-10th.